Elder Trevor Schmidt: Happy Valentine's Day!!! Well what a week it has been! In some ways it seems like it flew by and in others it seems like it has really drug on. We have a had some good things happen this week and we have had some things come up that we have had to deal with. However, over all it has been a pretty good week. This week we met with one of our new investigators, his name is Jay. We had a really good lesson with him. The first time we met with him was because we got a call from a member asking if we could go and give him a blessing. Elder Taylor thought it was a little weird because they had tried meeting with him in the past but he would always dodge their appointments, and said that he was really traditional. So we thought it was weird that he was asking for a blessing. So we went over to meet with him, this is just another testimony to me that the Lord is in charge of this work. That night we had three appointments cancel, so we were driving around disappointed when we received the call from the member. So we went straight over. We had a really amazing meeting with him and the spirit was so strong there, it was like it just slapped us in the face. We talked about a lot of stuff with him. He told us why he use to miss the appointments that he had with elders. He said that from what he understood there were a lot of similarities between their culture and the church. So we talked about how you have to distinguish between traditions and culture, and how there are similarities. He brought up medicine men so we talked about that and how God commands there to be no priestcrafts. It was a really awesome lesson and he really understood it. So this week we had planned to talk abut the Book of Mormon. So in the beginning we were just talking and he asked a question that led right into bringing the Book of Mormon in. It was amazing. We read the introduction with him, and he thought it was amazing! We had him read the second paragraph the talks about how the Lamenites are the principle ancestors of the American Indians. As soon as he understood that he said I want to read the whole thing! It was awesome. I am really excited to continue working with him. He really wants to change his life. This week we had a pretty neat opportunity. Just after district meeting on Thursday we got a call from the seminary teacher. He wanted us to come and talk to the students and present pass along cards and Book of Mormons. He challenged each of them to pass out at least one pass along card this week and if they were filling up to the challenge to pass out a Book of Mormon. All of them took at least one and most of them took multiple pass along cards and there were about eight kids that took Book of Mormons. That was pretty awesome to see. Then later that day we got as call from one of our bishops asking us to speak in Sacrament meeting, and he gave us the topic of missionary work. So I decided to talk to the youth about missionary work. Something that I have come to realize on my mission is that the youth have so many opportunities for missionary work! Something I wish I would have realized more when I was a teenager and done better at. But the best way that we have is in the way we live our lives. There is a quote and I'm not exactly sure who it is by, but President Uchtdorf used it in last Aprils conference. It goes "At all times preach the Gospel, and if necessary use words." I really like that! Because we all should be like Paul when he says "I am not ashamed of the Gospel of Christ..." We should be proud to be a member of Christs church, the one and only true church on the Earth today! Make it known, and be an example to those around us, perhaps that is one of the greatest missionary tools that we have. "Be an example of the believers..."
Sounds like it will be a busy week back home. Seems like you have a lot going on. It would have been fun to be there for Rachel's blessing. Maybe one day I will make it to one of those. Well I hope you all have a wonderful week! I know I will! I love you all! Elder Schmidt has been called to serve from February 2011 to February 2013 in the New Mexico, Farmington Mission where he will diligently preach the gospel of Jesus Christ. Elder Schmidt with President and Sister Jones! 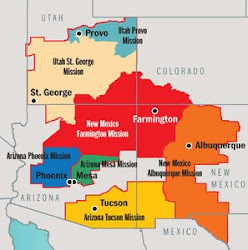 The red area is the New Mexico, Farmington Mission. 1313 A East Maple St.